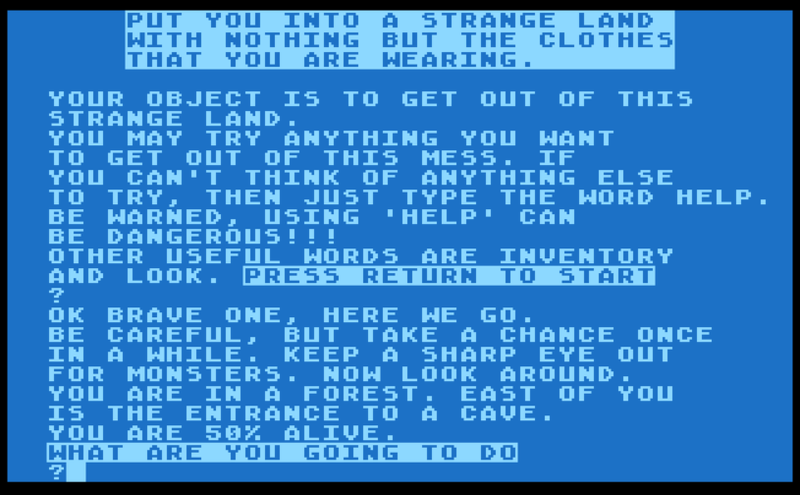 This week's subject, Wizard's Revenge, is another of an informal series of text adventures published by the Atari Program eXchange for Atari's 8-bit home computers, and the only one I hadn't yet tackled in my recent posts about these games. 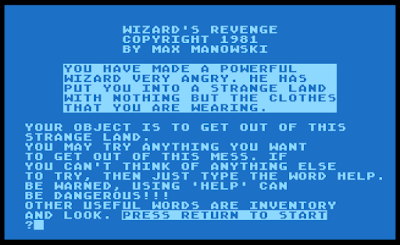 Wizard's Revenge was written by Max Manowski circa 1981, and does not appear to use the same parser as the other adventure games in the APX library. It also has a few role playing game-style elements, so it may present some different challenges. The plot is fairly standard early-adventure material -- the player has been banished to a strange land by a powerful wizard, though this setup does more than most adventure games bother to do, in explaining why the player starts out in an unfamiliar place with no possessions to speak of. The game also handles illumination in a more sophisticated way than most adventures of its era, and the structure is very open-ended -- there aren't many required puzzles, there are a lot of red herrings and atmospheric optional locations to visit, and the player is given a lot of freedom to explore. As the game begins, we find ourselves in a Forest. YOU ARE 50% ALIVE, we're informed, suggesting that there is a role playing game concept of the player's health involved here. There's a cave to the east, but I'm going to do a little exploring and mapping first. My initial attempt to head North meets with resistance, as the parser informs us that I DO NOT ACCEPT ABBREVIATIONS. NORTH is more successful, leading to a clearing in the woods with a green pole stuck in the ground. I try to EXAMINE POLE, and the parser's visual response suggests it's only really recognizing POLE -- but just the same, the ground trembles, and we fall through a newly-opened crack before it closes above us. We are now in a Dimly Lit Room, with passages west, east, and south. Heading SOUTH, we pass through a room with a little light visible to the south, into a Very Narrow Passage -- I thought the game had gotten hung up here, but there's just a pause as we find a sword, get stuck, and struggle back into the room to the north. Just out of curiosity, I try this again -- and on the second try, I get attacked by vampire bats and my health drops to 37%. This happens again on subsequent tries, until I'm dead, so I guess we're only supposed to find one object here. What's interesting is that after I restart and make another attempt, I acquire a silver button instead of the sword. Curious, I start again and pick up a potion. So it seems this is a way to acquire only non-critical items. Here, we can only go back north, or west into a Dry Room with a torch on the wall. I try to TAKE TORCH, based on my recent experience with APX adventures, but we can only GET TORCH... no, that doesn't work either... ah, my mistake. 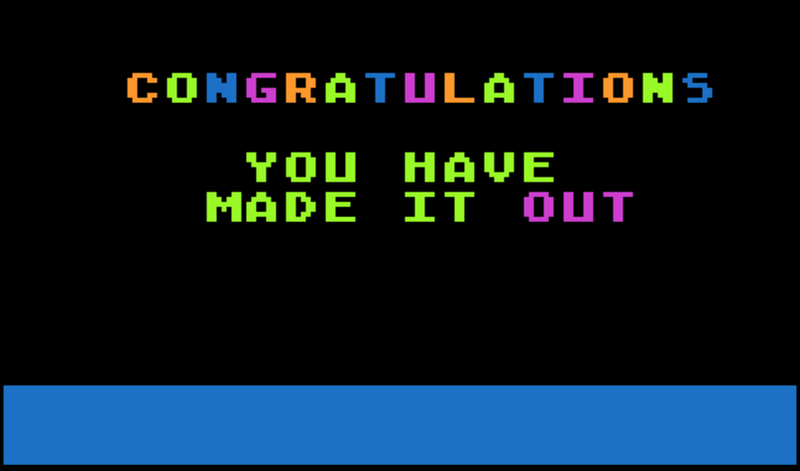 I'd gone back to the damp room, and instead of telling me the torch wasn't available, the parser was just saying HUH? in response to GET TORCH and WHAT? for TAKE TORCH. This suggests the nouns are treated according to situation or location, and maybe given priority over the verbs; the parser actually underlines the words it recognizes with up-arrows after we enter a command, giving us some hints as to how the game "thinks." In the dry room, I do successfully TAKE TORCH -- and it's already lit, saving us hunting for matches and such. The passage mentioned leading north turns out to be too narrow to enter, but the torch's light reveals that it seems to run on for quite a distance. The only other apparent option is to head WEST, which leads us back to our starting point. I still have some areas to explore inside the cave, but let's check out the map above ground now that we're back here. Heading west from the forest leads to a Small Stream, flowing north to south. DRINK WATER here proves refreshing, but doesn't seem to improve our health, which remains at 50%. I head NORTH again and find the source of the stream at the mouth of a small cave. I DRINK WATER once and feel stronger -- but health stays where it is, and when I try to drink again, I die of an overdose! After a restore (there is no SAVE GAME command, so I'm glad I'm playing under the Atari800Win emulator) I drink just once, and confirm that we can't go north or west here, and EAST returns us to the clearing with the green pole, though it's no longer here after I disturbed it earlier. In the interest of mapping, I follow the small stream south this time, to the point where it flows into a small crack in a large rock. Trying to go west from here leads into an area where The Ground Here Is Very Swampy, and the game appears to hang. So I have to restore again, and hope this doesn't happen too often; the same thing repeats when I try again, so it might be a bug or an intentional dead end. I'll steer clear of it for now. South of the forest is an area with many trees, and ONE OF THEM IS VERY TALL. We can't go UP, but we can CLIMB to see a deep valley far to the east. I try to go NORTH, and subsequently fall from the tree, knocking my health down by 9%. CLIMB does not bring us back down, but DOWN works here. Just to be thorough, I learn that trying to head EAST from the treetop is fatal, but the player's character is somehow wiser about heading south or west. So maybe under some circumstances yet to arise, we will be able to head east? I head south of the tall tree to find more trees and a large hole in the ground. The game seems to hang up again if I try to go WEST of this point, and we can't go DOWN into the hole, at least not that way. EXAMINE HOLE proves unintentionally effective, as we find the edge of the hole slippery and fall into it. This leads us back to the room where we felt moss earlier, but with the torch in hand, we can now see it much more clearly. It has mossy walls and passages leading east, south, and west. This is a really nice way to handle illumination -- we were able to explore in the darkness before we had a proper torch, which is a more natural solution than the usual it's-so-dark-you'll-break-your-neck-just-by-walking-around situation these games often present. With this insight, I travel back to the dimly lit room we visited earlier, which is now just a room with passages to the west, east and south. I haven't been west yet -- this leads to a room with a Musty Smell, and we can continue west to a small room with a door on the west wall. I try to EXAMINE DOOR, and end up wounded somehow, though the game suggests we might be able to push harder. This seems misleading, as another attempt produces a click, and a dart is stuck in my neck, costing some health as I pull it out. PUSH DOOR produces a similar result, and with my health dropping again I opt to restore to a previous save state. Heading back to the east, I see some strange powder near the north wall. We can't TAKE POWDER, or PUSH WALL to look for dust-disturbing secret panels, but if we try to go NORTH, a spark from the torch lands in the powder, and it explodes! We don't seem to suffer much damage, but the torch is now useless. I try to DROP TORCH after a restore, but DROP is not even a recognized verb, so we'll do some more mapping before we try to push through this area. I do discover that if we let the torch be blown up, and try to go NORTH, we're told that it's too dark to see anything -- but if we type LOOK, we can learn that we're still in the musty room despite the lack of a light source. We have some more mapping to do, so I'll head east of the formerly dimly-lit room into a dead end -- but when I try to turn back, a bright flash occurs, we move through the air, and find ourselves in a small cave with a poisonous snake approaching. I try go SOUTH but fail to escape a deadly bite. After yet another restore, I attempt to KILL SNAKE, and to my surprise I'm able to do so even though I don't have an obvious weapon in hand. But the game hangs again here, and I'm starting to wonder if I'm even going to be able to play this one to completion. What next? Let's check out the strange sound to the east of the mossy room. The passage turns north into a Very Large Room with water blocking the way north and a large, apparently friendly bird. I try to EXAMINE BIRD and SING BIRD and PET BIRD, but only get strange looks and more chirping. CLIMB doesn't work -- he's not that large -- nor does RIDE BIRD. I try to EXAMINE POTION, in case it might be helpful here, but the parser assumes I want to imbibe it, and I find myself back at 100% health... just before the game hangs again. What is going on? 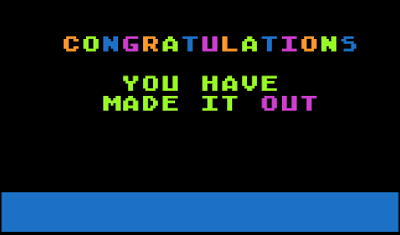 I set up my emulator to run as an Atari 800 with OS-B instead of as an Atari XL, reboot, and now the game seems to be slightly more cooperative. My quick test, heading into the swampy ground west of the trees, leads to a pearl and a hang-free prompt. I opt to head north into knee-deep water, where I get bitten by a water moccasin and die. Restarting, I go to the bird room, and trying to go NORTH reveals that we must either WADE or SWIM. SWIM is not great, as a large fish bites us and we're wounded. WADE has the same effect. Dang it! Entering the narrow passage, luck grants me a book this time. READ BOOK reveals a single page of writing: "TO LEAVE THE CASTLE, KEEP GOING EAST." That will probably be useful advice. Next, I try to KILL SNAKE in the small cave again, but this still seems to hang the game. I restart and pick up a worm in the narrow passage, which enables me to GIVE WORM and get the bird to fly me across the water. This game seems to depend on random events to a startling degree! We enter a small passage here, crawling to discover a key before we have to back out. The passage caves in, but another passage north takes us to a Round Room with passages west and south. Writing over the south passage reads: "WHEN SMILED AT ALWAYS SMILE BACK," but then the writing fades away. We might as well head south, then, to a dead end where a rock SEEMS TO STICK OUT IN AN UNNATURAL WAY. I TOUCH ROCK and fall through a trap door, landing fatally on some spikes. So we'll restore and avoid doing that. Instead, we'll go west into a room with passages to the south and west. THE NORTH WALL LOOKS STRANGE, but we can't walk through it or otherwise interact with it. The south passage leads to a room with walls that sparkle, and no obvious exits. SMILE and SMILE WALL aren't productive, but I TOUCH WALLS, and we find ourselves at the west end of a valley with steep sides and a western sparkling wall, presumably way to return. Heading east, I pass some bushes, and reach an area where the walls are not as steep. CLIMB still fails, but we're not hurt after sliding down from about halfway up, and we can continue east to an intersection of two valleys. A partially readable sign suggests, "TO EXIT GO .O.TH," which means it's a good time to save state for the umpteenth time -- and also suggests that Mr. Manowski's game must have felt a little sadistic in its original, unSAVEable form! I opt not to decide yet, and check out the east end of the valley, where some rocks are starting to fall. EXAMINE ROCKS proves fatal, though, as they crush our health turn by turn, and we can't escape by heading back to the WEST -- all we can do here, in fact, is suffer wave upon wave of falling rocks until we're dead. Restoring and heading north instead, I find some bushes at the north end of the valley, and go west into a small room with a passage west and a small gem in the wall. Going west leads us to the small cave with the poisonous snake we earlier reached by another route, and again the game hangs up. I'll restore and try going south at the intersection -- this leads to a stairway in the south wall. The steps are tiring, we're told, but we are able to climb them and arrive at a clearing. To the west is a tall tree -- similar to but not the same as the earlier one -- where we can see a valley to the north and a river to the east. Further west is a clearing with some bushes bearing yellow berries, which I'll ignore for safety's sake at the moment. This game's map is fairly large, though there aren't a lot of inventory items or puzzles to deal with. I'm going to go back to the east for now, discovering a castle near a river with an open door. GO DOOR is not recognized, EAST causes us to drown in the river, and GO CASTLE is also unproductive. It finally dawns on me that, with the castle's door on its east wall, we've probably just come through that door -- which suggests we're making progress escaping said castle. I try going SOUTH from here, finding a log across the river that DOESN'T LOOK SAFE TO CROSS. But with the luxury of a save state to back me up, I try to CROSS LOG anyway... and to my surprise, victory is ours! The game still feels a little bit unfinished, with lots of loose ends, so I restore to my pre-log crossing situation and wander around this area a little bit more. I meet a smiling man in the woods to the west, and SMILE gets him to tell us that "IT'S SAFE TO CROSS THE LOG," which we'd already figured out. I find a flute in a grove of willow trees, but can't PLAY FLUTE to do anything with the poisonous snake. I get the impression that certain random events, especially the discovery of one of multiple possible objects in the narrow passage early on, allow Wizard's Revenge to have multiple solutions, but I'll stop here, satisfied to have found one of them at least. 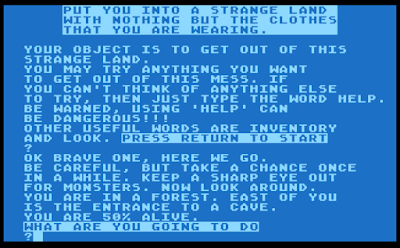 Wizard's Revenge is certainly not a standard adventure game -- it's got some odd behaviors and a few bugs, but as what I surmise is an attempt to produce a more RPG-like, loosely-structured experience, it's not bad. The map is very large and I have to think that other paths to the ending are available -- at the least, the design presents a greater illusion of choice than most text adventures of its time. As far as I can determine, this is the only game Max Manowski ever published, so we don't have any other examples of his approach to the genre to compare to this one. But I enjoyed wandering through this expansive, if largely plot-free, adventure game. "I highly recommend using a modern emulator"
KEMING? What on earth is that?